Be My Valentine and get 15% off! Valentines Day is around the corner. What better way to show your special someone that you love them, than by giving them something that will last a lifetime? Any time they pass the wall that it hangs on they will be reminded how much you care. My husband did this for me, and every time I pass it, I can’t help but smile. It gives me the warm fuzzies. So BEMYVALENTINE! I actually already have a valentine (the husband that I mentioned before). 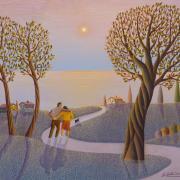 BEMYVALENTINE is our coupon code that will give you 15% off your purchase at Naive Art Online. We hope that you and your special someone have a memorable Valentines Day!